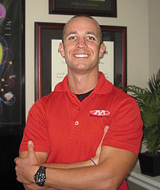 Dr. Joe Szafranski graduated from San Diego State University in 2005 with a degree in molecular biology. Shortly after completing service in US Marine Corps Reserve, he began clinical work at Life Chiropractic College West in 2007. A big part of Dr. Joe's commitment to health and wellness is seen in his dedication to assisting elite athletes. He has traveled to the Brazilian Jiu-Jitsu Pan American Championships, The Crossfit Games, and US Judo's Pan American Cup of Ecuador to help athletes compete at peak levels. Additionally, he cares for his Alma Mater by providing treatment to the SDSU Cheer Team in an effort to assist in their goal of training and competing at a championship level. Dr. Szafranski has an extensive background in Personal Injury care and works with many attorneys around El Cajon, La Mesa, Alpine, and San Diego. When sending a client to Dr. Joe, attorneys can expect proper documentation, evaluation, re-evaluation, imaging, and specialist work as necessary and appropriate. He will provide complete, all-encompassing reports within 2 weeks of the treatment completion for all patients involved in an auto accident. Dr. Szafranski is specifically trained in identifying injuries caused by auto accidents and evaluating for impairment ratable injuries. These findings are based on the AMA Guides to Permanent Impairment 5th Edition. His clinic identifies spinal disc injuries, and the often overlooked, Alteration of Motion Segment Integrity (AOMSI) when present. All findings are summarized based on current medico-legal standards in patient reports. All patient's are treated with attention to customer service and an integrative approach of active muscle work, rehabilitative exercise, home rehab exercise, home care instruction, and chiropractic care all as necessary and appropriate for maximum patient improvement.